Studd began his missions career with Hudson Taylor in China in 1885. As with the others in The Cambridge Seven Charles Studd was born into wealth and privilege. In 1882 & 1883 he represented England in the original 'Ashes' cricket tests between the British and Australia. In 1883 he graduated from Trinity College, Cambridge. 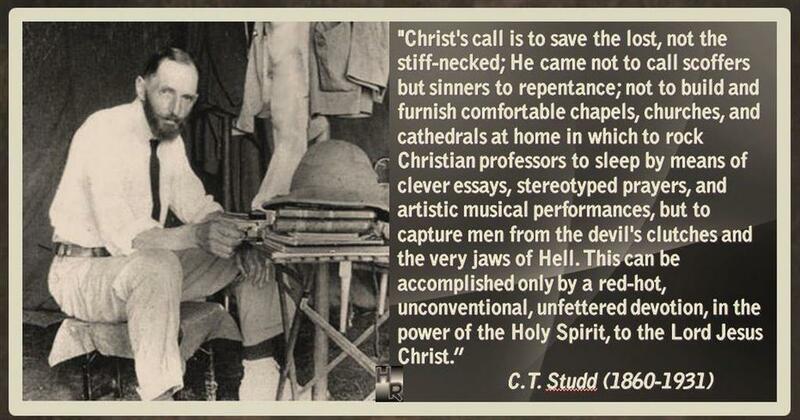 Yet, Studd (and The Cambridge Seven) was cut from the same spiritual cloth as Taylor. He trusted immovably in God's provision, such that in 1885 after his father's death he gave away his entire 29,000 pound inheritance. A fortune. As with Hudson Taylor he lifted his cross and followed his Lord. Studd served the Lord in China, then India and finally Africa. In 1913 he formed the World Evangelisation Crusade (now WEC International) which operates to this day. Some wish to live within the sound of church or chapel bell, I want to run a rescue shop within a yard of hell. The light that shines farthest shines brightest nearest home. God’s real people have always been called fanatics. The “romance” of a missionary is often made up of monotony and drudgery; there often is no glamor in it; it doesn’t stir a man’s spirit or blood. So don’t come out to be a missionary as an experiment; it is useless and dangerous. Only come if you feel you would rather die than not come. Don’t come if you want to make a great name or want to live long. Come if you feel there is no greater honor, after living for Christ, than to die for Him. The best cure for discouragement or qualms is another daring plunge of faith. Christ wants not nibblers of the possible, but grabbers of the impossible by faith in the omnipotence, fidelity, and wisdom of the Almighty Savior. 'The impossible is available to those who rely on the eternal'.